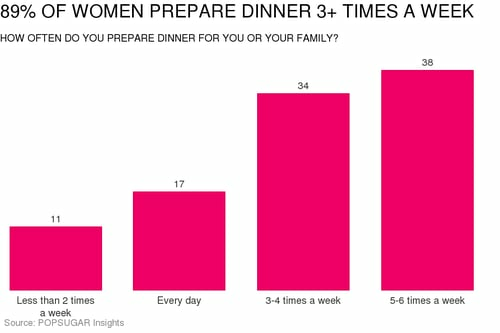 For dinner, 89% of women prepare dinner at home 3+ times per week. Seventeen percent of women indicated that they make dinner at home every day, and 38% of women said that they eat at home 5-6 times per week. When not cooking a new dinner, 61% of women indicated that they head over to a local restaurant to eat. Fifty-three percent of women stay home, preferring to heat up leftovers from the night before. One in three women pick up the phone and order delivery food.